No joke, we’ve made this four times in the past week. Yes, it’s in the healthy-sphere of cooking, and in spite of that fact we can’t stop shoving it in our faces because it is so completely delicious. I like to think I eat just like you. During the week, I try to eat on the healthy side of things: oatmeal or eggs for breakfast, leftovers for lunch and some type of grilled or roasted protein with greens for dinner. During the weekend, I’m all waffles, fried chicken and martinis. Truth. January is one of those months that tends to be a healthy dose of mid-week eating all month long. But I can never, ever, give up deliciousness. You eat like this too, right? So, this brings us to this dirty baked potato soup. 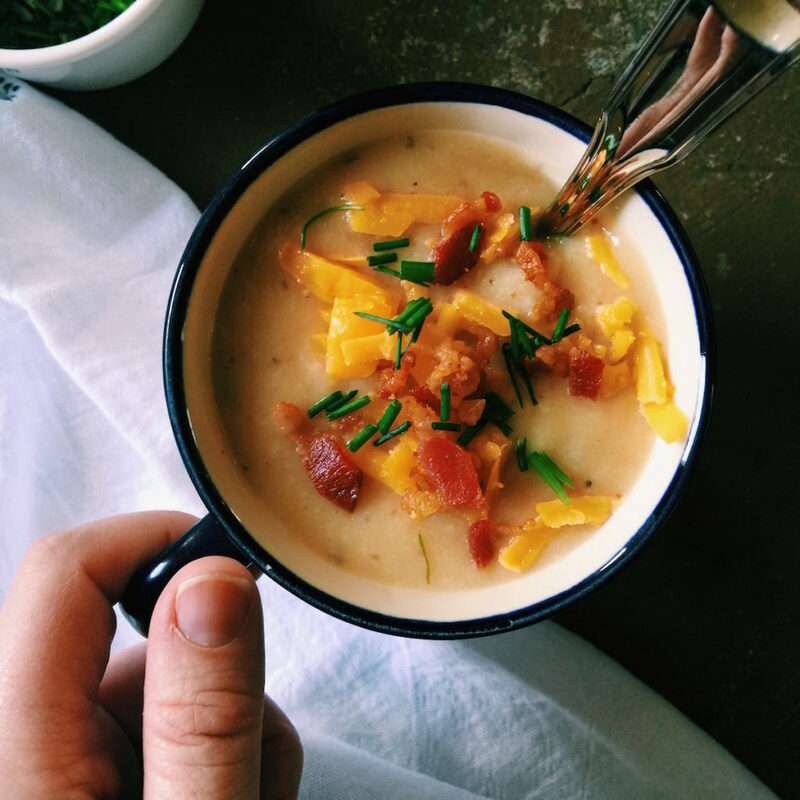 I was inspired by the Baked Potato Soup in the SkinnyTaste cookbook. When it gets the slightest bit chilly, I want something warm and comforting and this looked like all of that. I made the recipe as prescribed and it was good, but I wanted to give it some jazz hands. I wanted to keep the skin on the potatoes so that we could get some more vitamins and fiber in there and I reduced the milk because dairy isn’t always my friend. We’ve doubled-up on the cauliflower and sautéed onions in a little bit of bacon grease (holla) to add some nice smokiness to the soup. Umm, what else? Oh, I’m not a huge fan of reduced fat anything. So I replaced the reduced fat sour cream with 2% Greek yogurt and the reduced fat cheese with extra sharp cheddar cheese to really amp up the flavor. 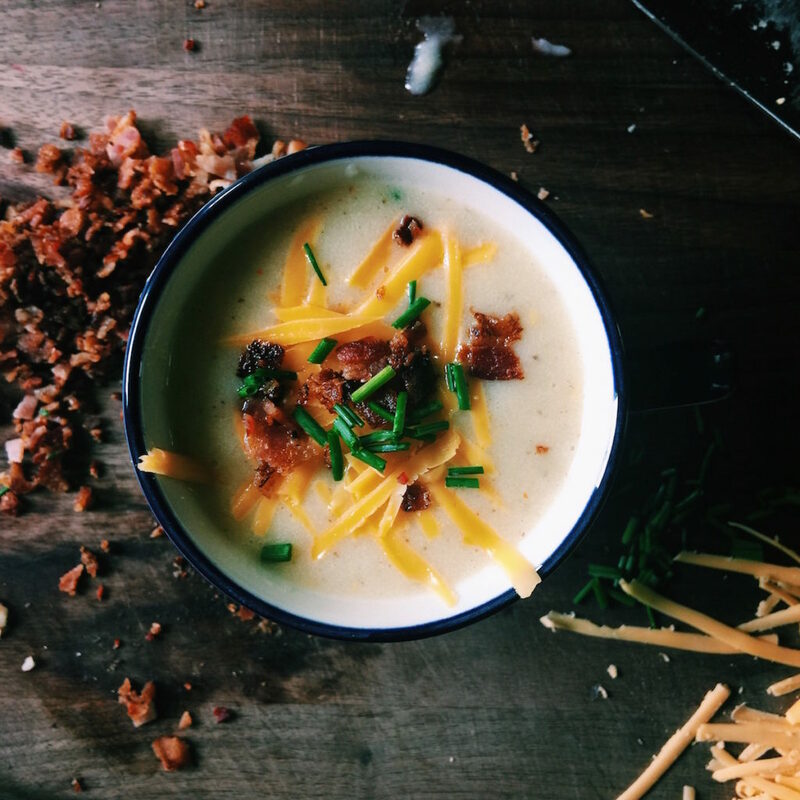 Let’s make this baked potato soup. I swear, once won’t be enough. It’s completely addictive. While the bacon’s cooking, chop your onions. Once the bacon is crispy and done, set it on paper towels to drain. Set aside. While the onions are cooking, chop your cauliflower and potatoes. Add the stock to the pot, scraping the bottom of the pan to release any brown bits. Then add the cauliflower and then the potatoes. You’ll want to do it in this order so that the potatoes are more steamed than sitting in the broth. Cover the pot, bring to a boil and then reduce the heat to a medium simmer for about 5-10 minutes or until the potatoes are easily pierced with a fork. Once you can pierce them easily with a fork, turn the heat off and it’s time to blend the soup together. Before we move into technique I want you to remember one very important thing: DO NOT OVER BLEND OR MASH!!! Your soup will sadly turn into glue. Here’s how I like to do it…I use my hand-held immersion blender and blend until everything is pretty smooth. My daughter likes the soup really smooth, so I give it a very quick (BRIEF!) spin in the Vitamix. If you do this latter bit I can’t stress enough the importance of doing less rather than more blending. One last note on blending…if you don’t have the immersion blender or a high-speed blender, you can mash it as you would mashed potatoes. Just note it won’t be as smooth, but it will still be delicious. If for any reason you think that it has become a bit on the glue side of things, add a little more broth (maybe 1/4 cup) and that should correct things. Put the soup back in the dutch oven and onto the stove over low heat…just enough to keep it warm. Add the ½ cup each of milk and Greek yogurt, stirring to blend. Grate 3 ounces of the cheese into the soup and stir to melt. Stir in ¼ cup of chopped chives to the soup. You’re ready to eat. That was easy, right? Your bowl will need about 1 ½ cups of soup, a sprinkling of 1 tablespoon of shredded cheese, 2 teaspoons-ish of chives and a healthy dusting of bacon. Now go snuggle on the couch by the fire. I’ve already proclaimed my love for Bill Maher. Sign this petition to get Obama on his show. Spread the word…50,000 signatures down, 50,000 more to go. Are we watching Making a Murderer? Thoughts? Guilty? Not guilty? Let’s argue and then have drinks, laugh and forget about it. 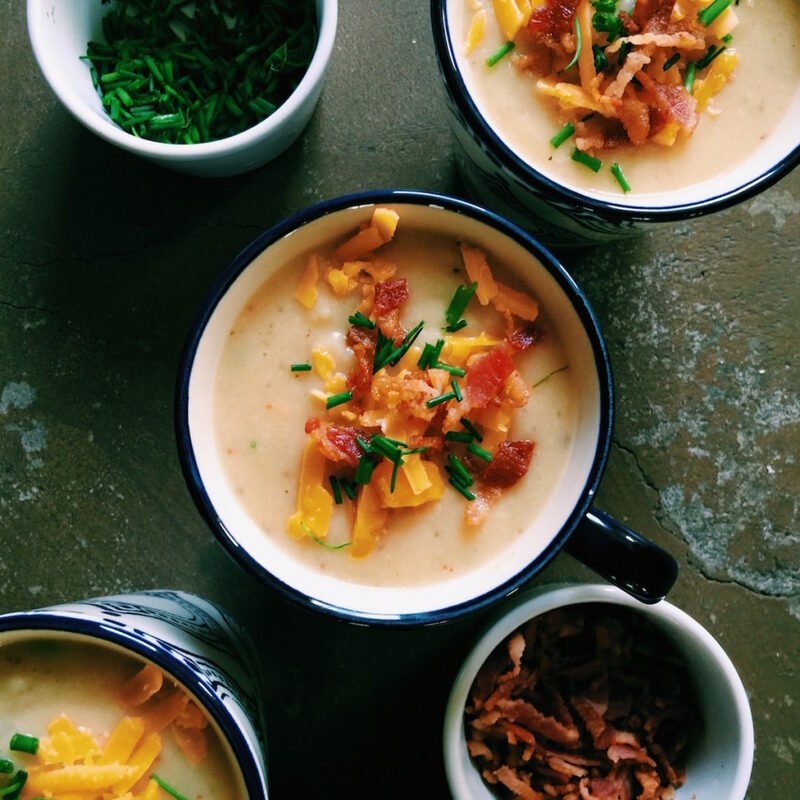 More S O U P S: Cheddar Corn Chowder, Harissa + Steak Chili (another obsession), Chorizo + Beer Chili, White-Girl Mexican Soup and Curried Carrot Soup (this can be served warm or chilled…and was my very first post…so be nice). Since we are smack in the middle of citrus season, I wanted to point you in the direction of my tart lemon scone. The recipe is over on the Hatchery…I’ve yet to add it over here. Rome wasn’t built in a day. I’m the new Vodka Feed Editor over at the feedfeed. Stay tuned for lots of vodka-based cocktails!! In case you missed last week’s detox salad, give it a looksie. Using hearty kale makes it so that we can keep this nugget in the fridge for a couple of days and then we don’t have to think about lunch. At all. Yay. I’m currently obsessed with these two food blogs: Feed Me Dearly and What’s Cooking Good Looking. This latter blog has a wonderful recipe for a citrus-turmeric smoothie which I tweaked a little bit. I put 1/4 cup almonds in 1 cup of water and let it sit for at least 30 minutes (up to overnight). Then add 1/2 to 1 banana, 1 tangerine, 1 small carrot, a little nub of fresh ginger and a teaspoon of either fresh or ground turmeric. Blend the crap out of it, add a couple ice cubes, blend a little more and serve. Are you glowing? Now go put your feet up and read through both of these blogs. I made this soup for my boyfriend and I, as it actually got chilly in north Florida, this fall. It was fun to make and irresistable. I was eating it out of the pot before I could even make our bowls. We sat by the fire outside and chowed down on this soup. He loved it! I love that it’s thick, like chowder. Incredible. This recipe made enough for us to eat for every meal for two days and we didn’t mind. We wished there was more but we gobbled it up so fast. 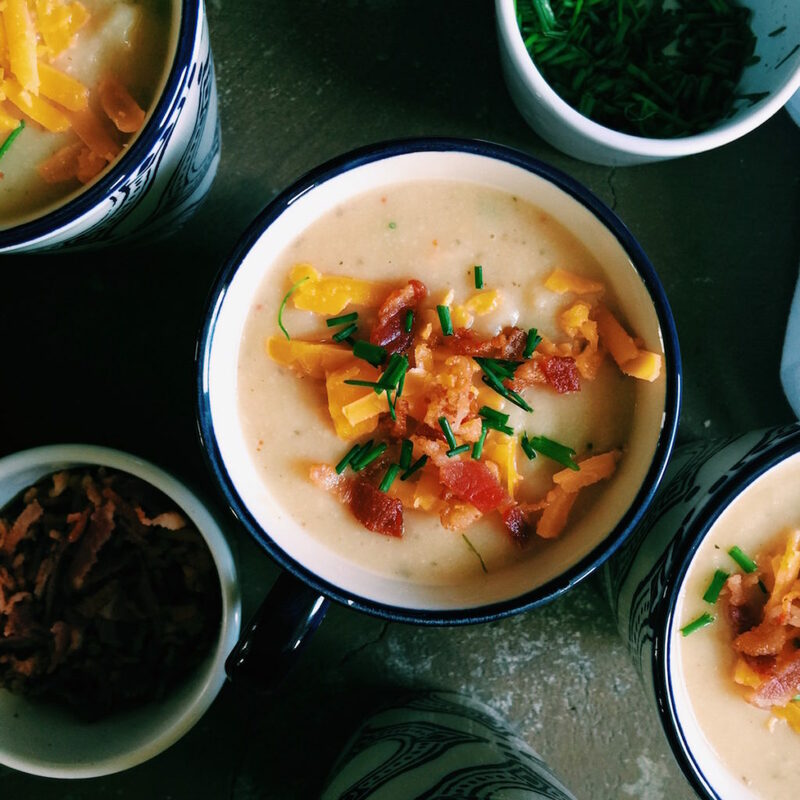 This potato soup is the best that both of us have ever had. So good! I will definetly be making this again (probably as a staple in my recipe book). Can’t get enough of this soup. Have made it three times since your post. The depth of flavor with the smoked paprika is amazing. Current best excuse to make bacon…..Thank you, again!! Just made this – SO GOOD! I substituted chrizo for the bacon and added celery for extra greens, so yummy! Made this last night. Just used one potato and it was rich, creamy and delicious. More for tonight, but will have to fry bacon because….well, it’s bacon. Thank you for this. Now, I am eyeing those brownies. So excited to try this soup, it’s already in next weeks meal plan! MB — Please let me know if you do! It’s so creamy from the potatoes and cauliflower, that I think non-dairy people could skip the milk and yogurt. Although I would completely miss the cheese. 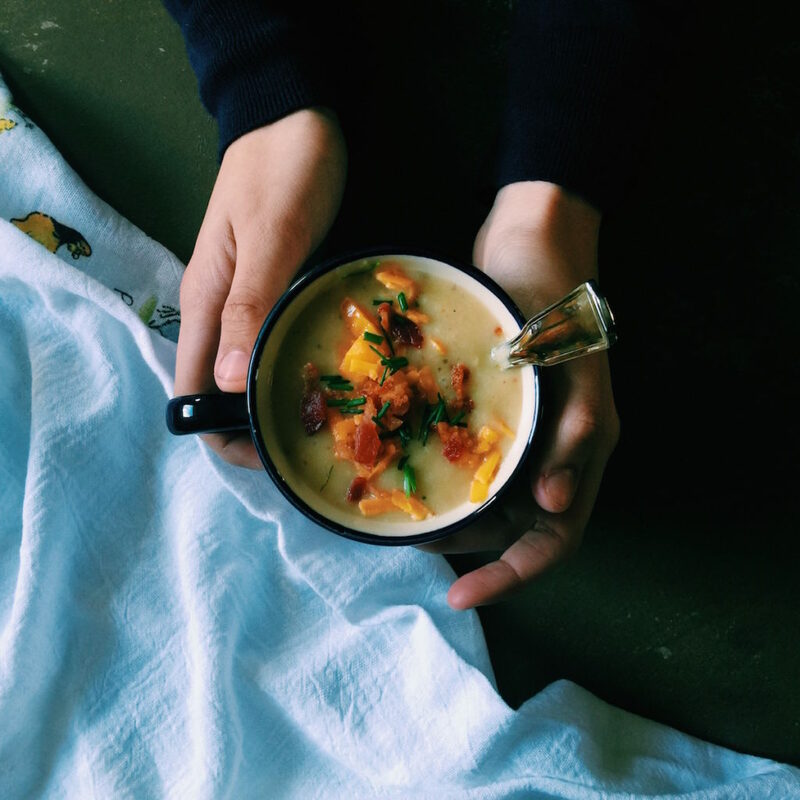 This soup looks so easy and delish! I’ll have to try is soon!! I hope you do Miya!